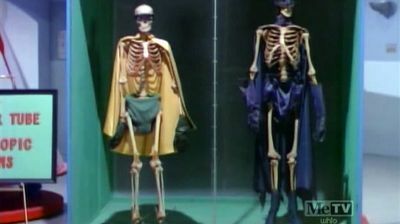 What appear to be the skeletons of Batman and Robin are found at Gotham City's Atomic Energy Laboratory, where the Mad Hatter left them to irradiate. Word of their demise spreads like wildfire. With the world busy mourning its loss, the Mad Hatter has no trouble snatching a valuable ruby from the Golden Buddha of Bergama's forehead. However, when rumor spreads that Batman and Robin are still alive, the Mad Hatter's scheme appears jeopardized.